In short, Potted Potter couldn’t be more fun and charming. If you like the Harry Potter franchise, and especially if you have kids who are fans, you should go see this show. Daniel Clarkson and Jeff Turner in Potted Potter. Photo by Brian Friedman. 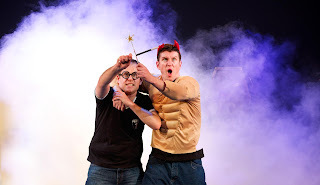 The play, whose full title is Potted Potter: The Unauthorized Harry Experience, A Parody by Dan and Jeff, is a 2-man, 70-minute riff on the entire Harry Potter series. It started out as a street performance, created by the actors Daniel Clarkson and Jefferson Turner, that was performed for people waiting in line to buy the sixth Potter book. It grew from there and quickly became a hit at Fringe festivals, on tour in the UK and US, and in London’s West End. While hitting all of the highlights of the Potter saga, the play is also about two actors, ‘Dan’ and ‘Jeff’, trying to put on this show. Jeff is the one leading the charge to tell the Harry story. Unfortunately, he is trying to do so with his friend Dan, who, despite his claims to the contrary, hasn’t read the books at all and is faking his way through this entire thing. His lack of knowledge doesn’t keep him from trying, though. For example, he was in charge of building the set and so, of course, he created a wardrobe so Harry and friends could travel to Narnia. The show is filled with more silliness along these lines. 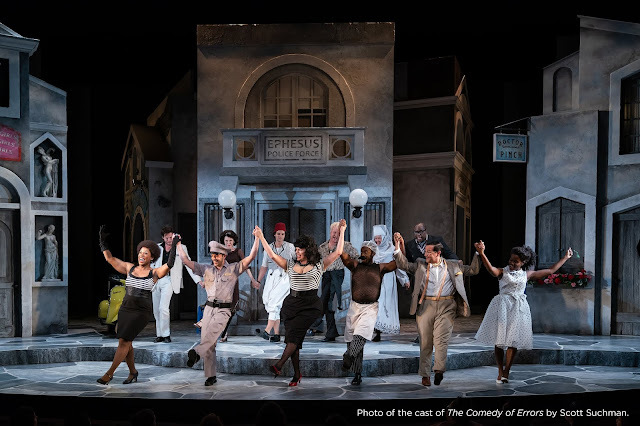 A good parallel is the Reduced Shakespeare Company’s shows like The Complete History of America (Abridged) and The Complete Works of William Shakespeare (Abridged). It is packed with quick costume and character changes, silly hats, lots of props, funny accents, and prat falls. There are quick strings of jokes, improvised bits (and scripted bits that feel improvised), and even some low-risk/low-stakes audience participation, including an epic game of Quidditch involving a beach ball. Potted Potter probably isn’t for people who haven’t yet read the books (or seen the movies), but want to someday, as it doesn’t shy away from telling major plot points. If you don’t care about spoilers, though, you could go and just enjoy the sheer energy and theatricality of the performance. And, if you know the Potter story, you will have a great time seeing your favorite parts of the story (kind-of) come to life. 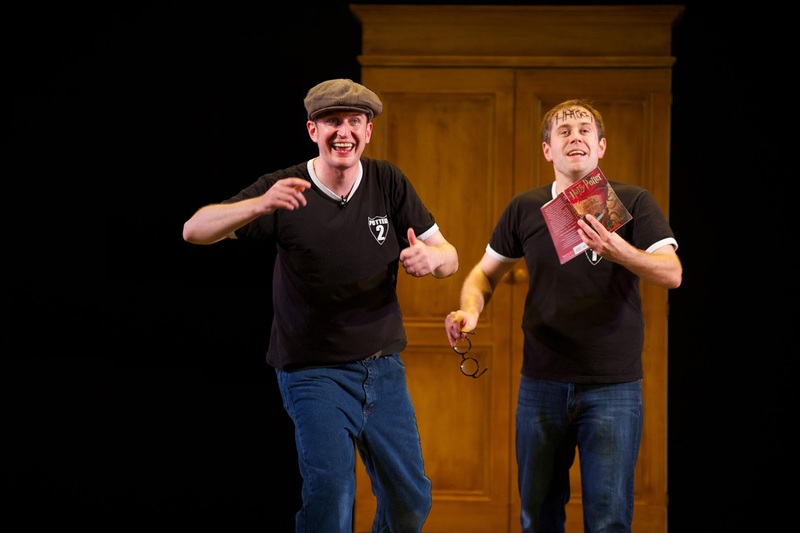 Jeff Turner and Daniel Clarkson in Potted Potter. Photo by Brian Friedman.